Highly conductive pristine graphene electrodes were fabricated by inkjet printing using ethyl cellulose-stabilized ink prepared from pristine graphene. Pristine graphene was generated by exfoliation from graphite using ultrasound-assisted supercritical CO2. 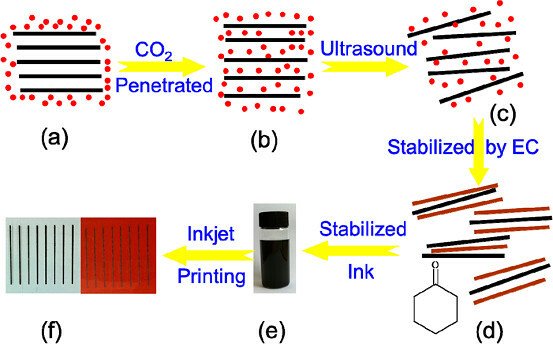 The ink, at concentrations up to 1 mg/mL, was stable for more than 9 months and had compatible fluidic characteristics for efficient and reliable inkjet printing. The inkjet printing patterns of the graphene on diverse substrates were uniform and continuous. After 30 printing passes and annealing at 300 °C for 30 min, the printed films developed a high conductivity of 9.24 × 103 S/m. The resistivity of the printed electrodes on the flexible substrates increased by less than 5% after 1000 bending cycles and by 5.3% under a folding angle of 180°. The presented exfoliated pristine graphene and the corresponding efficient methods for formulating the ink and fabricating conductive electrodes are expected to have high potential in applications involving graphene-based flexible electronic devices. Schematic illustration of the preparation process of pristine graphene ink and its printed electrodes. (a) Layered graphite was immersed in supercritical CO2. (b) CO2 molecules penetrated and intercalated in the interlayer of graphite, (c) forming single- or fewlayer-thick graphene sheets. (d) Graphene sheets were stabilized by EC in cyclohexanone and (e) formed stable graphene ink. (f) Graphene electrodes were printed on PET and PI substrates.